Butternut squash and brussels sprouts are roasted then tossed with torn frisée and bacon to create a warm salad that's sure to take the chill out of winter. Topped with a warm Dijon mustard vinaigrette, this nutritious and delicious roasted vegetable salad offers satisfaction without the heft. Who said comfort food had to be bad for you? Preheat oven to 400°F. On large, rimmed baking sheet, toss together squash, brussels sprouts, oil and salt. Roast 30 minutes, tossing occasionally, until vegetables are tender and brussels sprouts are lightly browned. Meanwhile, in large skillet, cook bacon over medium heat until crisp, about 7 minutes. Transfer bacon to paper towels to drain. Discard all but about 2 tablespoons of bacon fat from skillet. Add vinegar and mustard, and heat over low heat until combined. 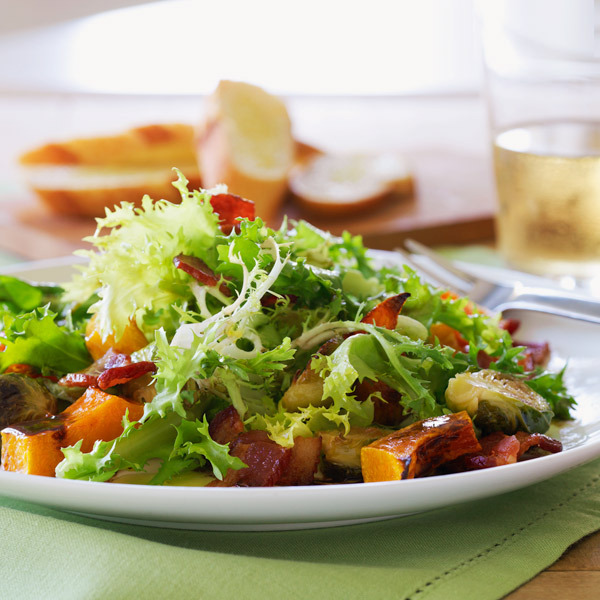 In large bowl, combine frisée, roasted vegetables and bacon. Pour on warm vinaigrette and toss to combine. Serve immediately.